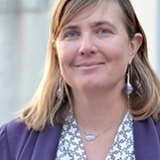 Heather Gray is an assistant professor of physics at UC Berkeley and has been a member of the ATLAS collaboration at the Large Hadron Collider for more than a decade. Originally from South Africa, she obtained her PhD from Caltech and then spent 7 years working at CERN in Geneva, Switzerland before moving to Berkeley. She made major contributions to studying the properties of the Higgs boson and is currently interested in how novel ideas from computing can be applied to particle physics.